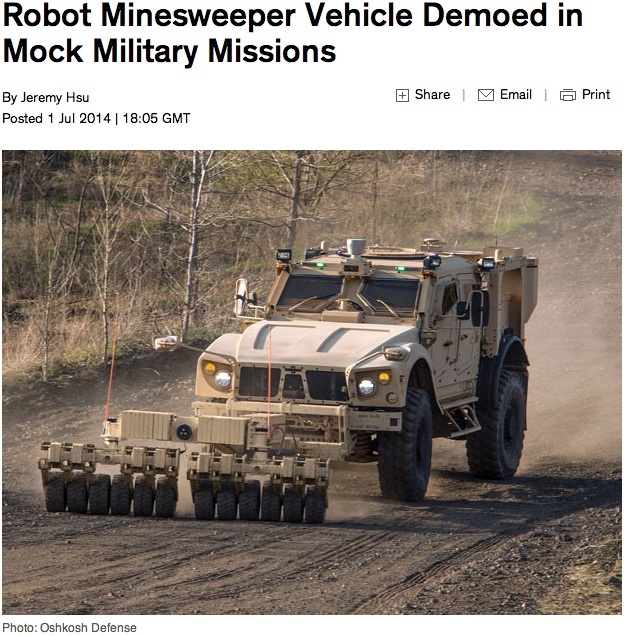 A robotic minesweeper aims to defuse lethal roadside bombs that represented the signature weapon killed or wounded thousands of troops in Afghanistan and Iraq. The all-terrain vehicle developed by Oshkosh Defense resembles an ordinary military vehicle equipped with a mine roller that can clear the way ahead of convoys without a human driver. Oshkosh Defense has worked with both the U.S. Marines and Army to figure out how its TerraMax Unmanned Ground Vehicle could act as the vanguard or scout for manned military vehicles—using mine rollers and ground penetrating radar detector to locate and set off mines or improvised explosive devices(IEDs). In a worst-case scenario, the TerraMax minesweeper could take the brunt of roadside bomb explosions or ambushes and spare the human soldiers following behind in their own vehicles. Oshkosh recently showed off its vehicle’s capability to navigate courses simulating minesweeping missions at the Eurosatory 2014 defense exhibition held in Paris from June 16-20.